1comment 2019-04-15 07:36:02 source:Check out the news KNEWS Author:Thick The second beauty energy comes! Wang Lin drove up to the top of Nanshan Mountain. He was stunned in a villa area with the same ruins. I don’t know how many times he was. He put all his family into the high-end name named “Dongqi Mirage Resort Hotel”. The villa project eventually became a "miracle". This project is located at the highest point of the Nanshan Scenic Spot in Chongqing. It sits on the Yangtze River, the Jialing River and the Yuzhong Peninsula. 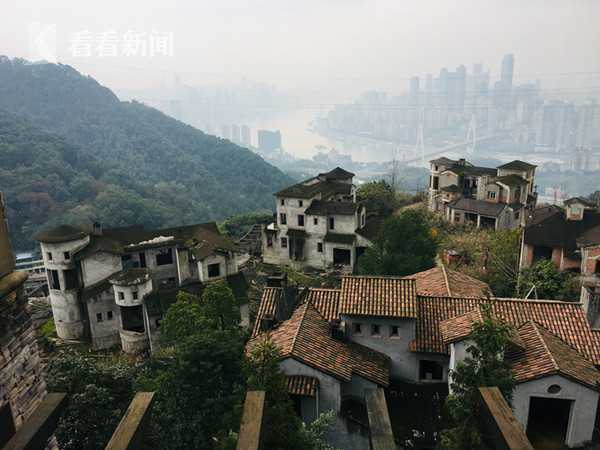 The location and environment are out of print in the entire Chongqing city. However, it has been in development for 11 years and has undergone a series of changes. In particular, through the two trust financing, the entanglement can not be extricated, has become a bad end project. The former "landlord" Wang Lin was out of this project early.Xinhua Trust Co., Ltd.(hereinafter referred to as "Xinhua Trust") is now the owner of this project. "This is the housekeeper who takes the property of the employer's family for himself." Wang Lin said. The Chongqing Higher People's Court ruled that Xinhua Trust had transacted the trust property under the different trust plans under its management when it was liquidated to dispose of the trust property of the Dongqi Mirage Project.Trust lawIt was awarded 40 million yuan in compensation and capital losses. Dongqi Mirage Resort covers an area of ​​118 acres and has a planned total construction area of ​​29,900 square meters, including 51 single-family villas and a super-luxury five-star resort hotel. The overall project has been completed 70%, and the pre-sale permit for the first phase of 27 commercial houses has been processed. The original construction unit of the project site is Chongqing Guanzhong Property Development Co., Ltd. and Chongqing Jinyuyuan Development Co., Ltd. The two companies established Chongqing Jinyuyuan Company in 1997 to prepare a tourism landscape park project called “Golden Garden”. After the economic problems, the company was bankrupt. 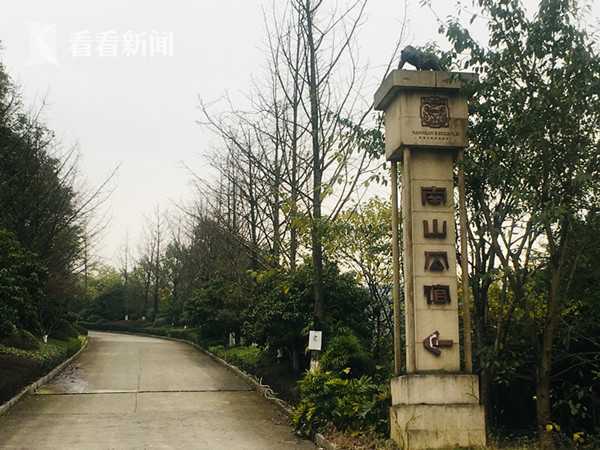 In 2002, Chongqing Dongqireal estateThe development company took over the land through judicial auction and planned to build the “Dongqi Wonderland Resort Hotel”. Then, the project obtained all development procedures through planning, land and housing management, construction, gardening, and forestry. Chongqing Dongqi Real Estate Development Co., Ltd. has three shareholders, Wang Lin, Liao Xuandong and Zhang Shiwei account for 40%, 40% and 20% respectively.BrokerWang Lin, a senior executive, became chairman. In February 2008, the resort was built. Despite the trade of the capital crocodile, the project investment construction is not smooth and has been plagued by financial problems.Listed companyChongqing Gangjiu(Quotes600279,Medical stockAfter being involved in joint development, after accumulating a total investment of 59.84 million yuan, it was forced to invest in huge follow-up capital and withdrew in 2009. Subsequently, Chongqing Dongqi transferred to trust financing and signed a trust cooperation agreement with Xinhua Trust. 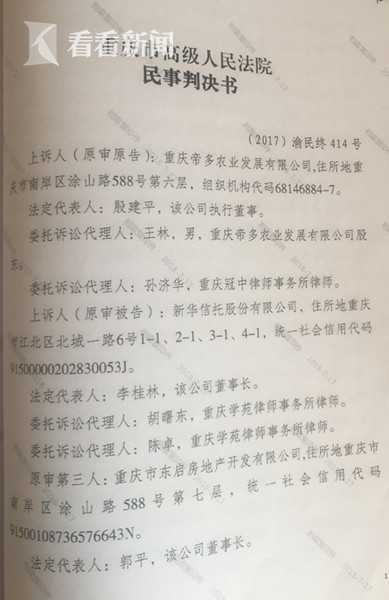 According to the trust statement, the trust period of the “Xinhua Trust·Dongqi·Wanjing Tourism Resort Hotel Equity Investment Collective Fund Trust Plan” is from November 6, 2009 to May 5, 2012, with a scale of 240 million yuan. Among them, the priority beneficiary part is 180 million, the general level part is 20 million, and the inferior part is 40 million. After all, all of them were subscribed by Chongqing Didu Agricultural Development Co., Ltd. (hereinafter referred to as “Diduo Agriculture”), a related company of Chongqing Dongqi. According to the requirements of Xinhua Trust, Chongqing Dongqi shareholders Wang Lin, Liao Xuandong and Zhang Shiwei will take Chongqing Dongqi 100% at a nominal price.Equity transferTo Emperor Duo Agriculture, and transfer to the name of Xinhua Trust, Didu Agriculture as the principal and beneficiary, signed a post-inferior beneficiary fund trust contract with Xinhua Trust. Xinhua Trust will use 8 million of the 240 million trust funds raised to transfer 100% of Chongqing Dongqi (a total of 8 million yuan of capital contribution), and the remaining funds will be invested in Chongqing Dongqi, where the registered capital will increase to 40 million yuan, increase capital reserve of 200 million yuan for the construction of Dongkai Mirage Hotel project. 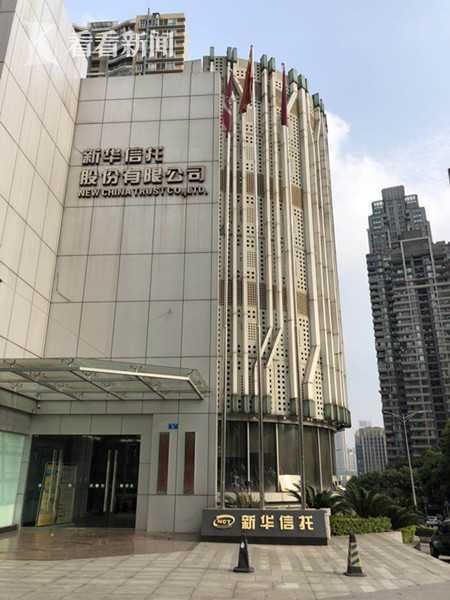 Xinhua Trust also monitors its daily operations by sending directors to Chongqing Dongqi Committee, implementing printing and fund supervision, ensuring the right to know about the daily operation and management of Chongqing Dongqi, and retaining important issues affecting the security of trust funds in Chongqing Dongqi. One vote veto. The funds raised were quickly exhausted, and the Dongqi Mirage Hotel was shut down in October 2011. On May 6, 2012, the trust plan expired, and Chongqing Dongqiyuan shareholders and Diduo Agriculture were unable toRepoChongqing Dongqi equity, or other ways to withdraw from trust funds. According to the trust agreement, at this time, Xinhua Trust can dispose of its own equity in Chongqing Dongqi and distribute the trust funds and proceeds to the beneficiaries through the equity transfer. "We were suddenly notified that there was no money or equity, and all the trust property was zero." This result made Wang Lin unable to accept it. "We handed over the net assets worth more than 2 billion yuan to the Xinhua Trust as a trust property, and paid 4000. After the 10,000 yuan in cash, a trust plan of 240 million yuan was established. If there is no such thing, then there is no more?" On May 28, 2012, Xinhua Trust issued a liquidation report. As of May 17, 2012, Xinhua Trust allocated trust proceeds of 49 million yuan to priority beneficiaries and general beneficiaries, and redeemed the preferred beneficiaries and general beneficiary trusts. The property principal is 200 million yuan. Inferior beneficiary, the trust property principal and income of Diduo Agriculture are zero. In fact, the liquidation funds come from another trust plan established by Xinhua Trust. In April 2012, Xinhua Trust established the “Zhongbang Series Robust M&A” before the Dongqi Trust Plan expired.Investment fundCollecting the trust plan and signing a fund trust contract with the investor. The duration of the trust plan is from May 3, 2012 to May 3, 2014, and the total trust fund is 450 million yuan. 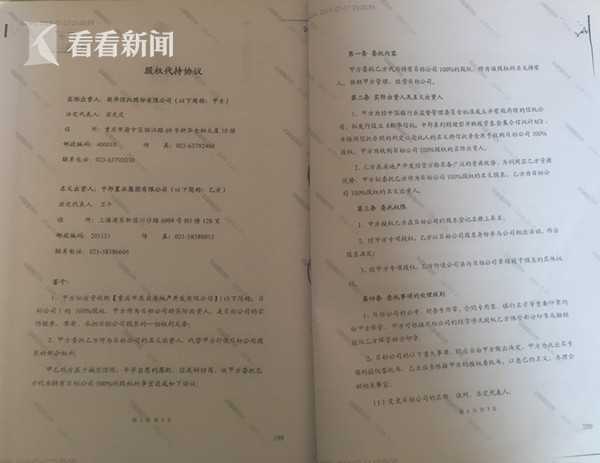 At the time of the issuance of the “Zhongbang Trust Plan”, the funds raised were widely used: “Investing in various industries, industries encouraged by the '12th Five-Year Plan', equity held by financial institutions, creditor's rights, asset income rights and trust beneficiary assets, etc. ", "Safe housing projects in line with national policies are prioritized for consideration." The actual use is directed to the clear--acquisition of the 100% equity and subsequent investment of Dongqi Company under the Dongqi Mirage Trust Plan. In this regard, Yang Su, a former employee of Xinhua Trust, said: "When we raise funds, we will explain to investors that this is not for the Dongqi project. The Xinhua Trust's other trust documents also see this design." She bluntly said that "new and old": "After the expiration of the Dongqi Trust Plan, all the investment money will not come back. The person who has the obligation to repay can't pay back and has no other transferee. The establishment of Zhongbang is a trust plan. Let the equity held by Dongqi Trust Plan end the liquidation of the original trust." Xinhua Trust’s “Report on the Liquidation of Dongkai Mirage Trust Plan” submitted to Chongqing Banking Regulatory Bureau on June 20, 2012 stated that “Zhongbang Trust Plan” acquired 100% equity of Dongqi Company in the name of Zhongbang Real Estate, and acquired The price is 380 million, including the equity transfer price of 216 million yuan, and the debt of Dongqi Company is 164 million yuan. The 2.16 billion yuan equity transfer payment has been used to pay the preferential beneficiary of the Dongqi Trust Plan, the general beneficiary's trust principal and the proceeds. Since there is no remaining trust property, the post-inferior beneficiary is more than zero. However, the 216 million yuan equity transfer price was strongly questioned by Tiedo Agriculture: this was significantly lower than the previous Xinhua Trust’s notice of the preferential repurchase price of Tiedo Agriculture (260 million yuan), and did not consider its 40 million yuan inferiority. Benefit rights, etc. Xinhua Trust also said: "Because of the reputation risk of our company, we did not transfer the equity of Dongqi Company publicly. However, the current situation of Dongqi Company and the negotiation results of our company and many interested parties, the bid of Zhongbang Real Estate is The highest is the most favorable for resolving the trust plan's redemption risk, ensuring the completion of the project's follow-up construction, and repaying Dongqi's existing debt." In fact, Zhongbang Real Estate is only the “puppet puppet” of Xinhua Trust. In May 2012, Xinhua Trust and Zhongbang Real Estate signed the “Equity Transfer Agreement”, stipulating that Xinhua Trust will transfer 100% of its legally held Dongqi Company to Zhongbang Real Estate with a transaction price of 216 million yuan. Behind this agreement, Xinhua Trust (Party A) also signed a “drawer agreement” with Zhongbang Real Estate (Party B) – the “Shareholding Agreement”. The two parties agreed that Party A intends to invest in the acquisition of 100% equity of Dongqi Company (the target company), which is the actual investor; Party B holds 100% of the equity of the target company and acts as the nominal investor to assist Party A in managing and operating the target company. The specific terms show that Party A intends to issue the Zhongbang Trust Plan, which will use the trust funds in the name of the trustee to acquire 100% of the equity of the target company. Upon the special authorization of Party A, Party B participates in the corresponding activities of the company as a shareholder of the target company and makes a shareholder decision. "Part A's investment income from the target company is wholly owned by Party A, and Party B shall not occupy investment income as a nominal shareholder." Also in May 2012, Xinhua Trust (Party A) and Zhongbang Real Estate (Party B) signed the “Entrusted Investment Agreement”, stipulating that Party A successfully raised and issued the Zhongbang Trust Plan, which will be raised from the trust account. The proceeds of 450 million yuan were transferred to the name of Zhongbang Real Estate and entrusted to invest in Dongqi Real Estate Company. In response to Xinhua Trust's series of operations, Dido Agriculture said that this is actually Xinhua Trust's “Blind Eye Law” with Zhongbang Real Estate. It has sent a trust plan to itself, and has moved our trust property to its own name without paying a penny. Become the trustee and beneficiary of this project. Formerly known as Shanghai Lianyang Real Estate Co., Ltd., Zhongbang Real Estate Co., Ltd. was established in November 2000. Its official website said that it is a national-level qualified professional real estate development enterprise, Shanghai Top 50 Real Estate Development Enterprise and China Top 100 Real Estate Development Enterprise. Before the settlement of the Dongqi Trust Plan, Zhongbang Real Estate was involved in the Dongqi Mirage Hotel Project and appointed Wang Xinyan, the manager of the Strategic Development Department, as the leader of the liquidation team. On May 17, 2012, the legal representative of Dongqi Real Estate was changed to Wang Xinyan by Wang Lin; Zhongbang Real Estate took over the project in June and resumed work in September, and renamed it Nanshan Mansion. The cooperation between Xinhua Trust and Zhongbang Real Estate is actually a secret operation. Look at the news Knews reporter found that the "Equity Holding Agreement" signed between the two have set a confidentiality clause. "With the consent of Party A, Party B shall not inform the third party of all matters involved in this agreement." “Xinhua Trust did not report or disclose to us.” A person in charge of Didu Agriculture told the news Knews reporter that Xinhua Trust’s disposition of 100% equity of Dongqi Company to itself through Zhongbang Real Estate’s holding method is Didu Agriculture gradually mastered the process of launching a lawsuit against Xinhua Trust. In June 2014, Dido Agriculture sued Xinhua Trust. Diduo Agriculture believes that after the expiration of the Dongqi Trust Plan, Xinhua Trust will not liquidate and audit the Dongqi Mirage Project, and should return the trust funds of 40 million yuan and compensate for the loss of funds. This battle is undoubtedly a tug-of-war. Until June 2017 and January 2018, Chongqing No. 5 Intermediate People's Court and Chongqing High Court respectively made judgments of one or two trials. Xinhua Trust compensated 40 million yuan of Emperor Agriculture and the loss of funds. The Chongqing High Court ruled that the Xinhua Trust’s liquidation and disposal of the Dongqi Trust Plan’s trust property was not in accordance with the contractual and legal provisions. “The trust property under different trust plans was mutually traded without the consent of the relevant principal or beneficiary. And there is no evidence that the transaction price is a fair market price." Judging from the facts ascertained, Xinhua Trust purchased the equity of Dongqi Company from Zhongbang Real Estate when it was liquidating the Dongqi Trust Plan, but it was actually the funds under the Zhongbang Trust Plan issued by Xinhua Trust. The purchase, that is to say, the trust property under the Zhongbang Trust Plan established by Xinhua Trust, purchased the trust property under the Dongqi Trust Plan established by Xinhua Trust. This behavior is prohibited by trust regulations. Article 28 of the "Trust Law of the People's Republic of China" stipulates: "The trustee may not trade its intrinsic property with the trust property or trade the trust property of different principals, but the trust document provides otherwise or through the principal or Except where the beneficiary agrees and trades at a fair market price." Bank of China(Quotes601988,Medical stock) issued by the Industry Supervision and Management CommissionTrust companyArticle 27 of the Measures for the Administration of Collective Fund Trust Schemes stipulates that trust companies shall comply with the following provisions when managing trust plans: (4) They may not trade with their own property and trust property; (5) They may not trade different trust assets with each other; (6) Different trust plans managed by the same company may not be invested in the same project. According to the above provisions, there are two conditions for the trustee to mutually trade the trust property of different principals: one is that the trust document has provisions or is agreed by the client or the beneficiary; the other is that the transaction is conducted at a fair market price. The Chongqing High Court ruled that the Dongqi Trust’s Dongqi Trust Document did not make the relevant provisions of the trustee’s trust property of each other’s trust property; Xinhua Trust also had no evidence to prove that the trust property of different principals Prior to the mutual transaction, the consent of the client or beneficiary of the Dongqi Trust Plan was obtained. Regarding the transaction price, the Chongqing Higher People's Court held that according to the “fund trust contract” signed by the two parties, the liquidation report issued by Xinhua Trust does not need to be audited by a third party, but according to the Trust Law, the trustee should deal with the best interests of the beneficiary. Trust business. The trustee must manage his trust property and perform his duties of honesty, credit, prudence and effective management. Xinhua Trust must prove that its liquidation of trust property is based on the principle of maximizing the benefit of the beneficiary. Xinhua Trust and Zhongbang Real Estate signed the equity transfer yin and yang contract, the calculation of the stock price is actually the 100% equity of Dongqi Company based on the sum of the priority income right and the general income right trust fund principal and interest, and there is no equity market Value is used as a reference. Therefore, the Chongqing Higher People’s Court held that Xinhua Trust’s claim that the liquidation price of the trust property is not lower than or even higher than the market value is insufficient. The final judgment of the Chongqing High Court was based on the trust funds originally paid by Didu Agriculture to Xinhua Trust.Gold marketThe general cost of capital use, the discretion of the loss of the agricultural industry, that is, based on 40 million yuan, from the date of the start of the trust plan (November 6, 2009) based on 24% annual interest rate. Xinhua Trust felt very embarrassed and filed a retrial application with the Supreme People's Court in July 2018. From the Fifth Circuit Court of the Supreme People's Court, the court will recently open the court to review the case. Xinhua Trust’s application for retrial indicates that the principal’s mutual transaction of the trust property does not necessarily result in the liability of the trustee. According to the Trust Law, whether Xinhua Trust should be liable for compensation still requires the loss of the trust property due to the transaction. Premise, the second instance has never been verified on the issue of loss. Xinhua Trust said that the transfer of the equity of Dongqi Company with Zhongbang Trust Plan has its special background: the Dongqi Agricultural Trust and the original shareholders of Dongqi Company have not been able to make multiple reminders for more than a year before the expiration of the Dongqi Trust Plan. The principal and interest of the trust required for the delivery of the due date; the commercial attributes of the Dongqi Mirage Hotel project and the years of remaining land use rights, as well as the management and financial confusion of Dongqi Company, result in the price of the Dongqi company's stock price inquiry, and the market value is far below the priority. The general beneficiary pays the required funds. There is also tremendous pressure from the so-called “rigid redemption” of public investors and regulation. “We were forced to solve the redemption problem of priority and general beneficiaries with the Zhongbang Trust Plan funds in the form of transferee equity and market value exceeding the market value, and additional investment in the Dongqi Mirage Project, in order to revitalize the assets. There is any purpose of embezzling the property of Didu Agricultural Trust.” Xinhua Trust claims that it still holds 100% equity of Dongqi Company and has not been able to withdraw from the cash. The loss amount is as high as 800 million yuan. Wang Lin believes that he and Tiduo Agriculture were kicked out without a penny of compensation. The Xinhua Trust used the trust property to inflict hundreds of millions of yuan in property damage and was suspected of committing crimes. He has reported to financial regulators and public security organs. After Zhongbang Real Estate was involved in the Dongqi Vision Project, the good times were not long. Due to major safety hazards during construction and failure to comply with construction procedures, the project was ordered to stop by the local urban and rural construction commission on May 29, 2013, and no further work has been resumed since then. 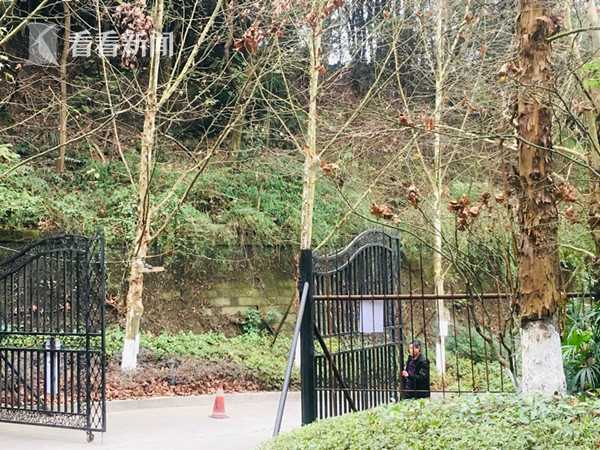 The road leading to the Dongqi illusion project is blocked by an iron gate, guarded by special personnel and heavily guarded. Look at the news Knews reporter was told that if there is no Xinhua Trust staff to accompany the project construction area. A person close to Xinhua Trust said that Zhongbang Property Owners had been evacuated as early as 2014. The project was stripped from Xinhua Trust as a non-performing asset and handed over to the same company.TomorrowBeijing Xinhua Jiufu Asset Management Co., Ltd. disposed of. Wang Lin, the shareholder of Chongqing Dongqi, told the news Knews reporter that Xinhua Trust used rigid or old funds to rigidly redeem in order to avoid investors' troubles, but did not disclose important information in the liquidation report to investors. The illusion of normal redemption. “Although the supervision and the Trust Law have never required rigid redemption, the unspoken rules of trust companies operating trust business have been followed, mainly because trust companies are considering maintaining their own credibility.” Xinhua Trust General Manager Hu recently admitted to the media that just against the increase can enhance investorsTrust industryAnd product confidence, attracting investors to participate and knowing the trust, rightTrust marketThe growth and development have played a positive role. As a star company of the "Tomorrow Department", the Xinhua Trust Day is actually not good, and the business situation is getting worse. Since 2013, non-performing assets have increased substantially, and the net profit has been “falling off the cliff”. It has already fallen from the first echelon of the industry to the bottom of the ranking. Among the 61 trust companies in the country that just announced their 2018 net profit, Xinhua Trust ranked 60th with a net profit of 29.76 million yuan, and its net profit decreased by 81.8% compared with 2017. Xinhua Trust’s collective trust business was suspended by the regulatory authorities in 2014 due to “serious risks” and was not re-released until 2017. At the same time, the company has frequently encountered a crisis of redemption and has become a veritable “stepping professional”. In 2018, the "Tomorrow Department" in the market will transfer the equity of Xinhua Trust, which will be China.CYTS(Quotes600138,Medical stock) China Youth Travel Industry Co., Ltd. under the group. A person familiar with the Xinhua Trust told the news Knews: "The 500 million yuan purchase intention has been paid, but then there has been no movement." This statement has not been confirmed by the parties. In 2018, the newly established trust property of China's charitable trust was 1.101 billion yuan, an increase of 84% year-on-year. Trust inquiry: Interpretation of the recent bizarre loss of art trust property! Does the trust plan VAT affect the trust investor's rate of return?